Presumably he wanted to make a name for himself, which is why I won’t identify him. His name deserves to be forgotten. Discarded. Deleted. Labels like “madman”, “monster”, or “maniac” won’t do, either. There’s a perverse glorification in terms like that. If the media’s going to call him anything, it should call him pathetic; a nothing. On Friday night’s news, they were calling him something else. He was a suspected terror cell with probable links to al-Qaida. Countless security experts queued up to tell me so. This has all the hallmarks of an al-Qaida attack, they said. Watching at home, my gut feeling was that that didn’t add up. Why Norway? And why was it aimed so specifically at one political party? But hey, they’re the experts. They’re sitting there behind a caption with the word “EXPERT” on it. Every few minutes the anchor would ask, “What kind of picture is emerging?” or “What sense are you getting of who might be responsible?” and every few minutes they explained this was “almost certainly” the work of a highly-organised Islamist cell. Norway was targeted because, compared to the US and UK, it is a “soft target” – in other words, they targeted it because no one expected them to. When it became apparent that a shooting was under way on Utoya island, the security experts upgraded their appraisal. This was no longer a Bali-style al-Qaida bombing, but a Mumbai-style al-Qaida massacre. On and on went the conjecture, on television, and in online newspapers, including this one. Meanwhile, on Twitter, word was quickly spreading that, according to eyewitnesses, the shooter on the island was a blond man who spoke Norwegian. At this point I decided my initial gut reservations about al-Qaida had probably been well founded. But who was I to contradict the security experts? A blond Norwegian gunman doesn’t fit the traditional profile, they said, so maybe we’ll need to reassess . . . but let’s not forget that al-Qaida have been making efforts to actively recruit “native” extremists: white folk who don’t arouse suspicion. So it’s probably still the Muslims. Soon, the front page of Saturday’s Sun was rolling off the presses. “Al-Qaeda” Massacre: NORWAY’S 9/11 – the weasel quotes around the phrase “Al Qaeda” deemed sufficient to protect the paper from charges of jumping to conclusions. While I slept, the bodycount continued to rise, reaching catastrophic proportions by the morning. The next morning I switched on the news and the al-Qaida talk had been largely dispensed with, and the pundits were now experts on far-right extremism, as though they’d been on a course and qualified for a diploma overnight. Some remained scarily defiant in the face of the new unfolding reality. On Saturday morning I saw a Fox News anchor tell former US diplomat John Bolton that Norwegian police were saying this appeared to be an Oklahoma-style attack, then ask him how that squared with his earlier assessment that al-Qaida were involved. He was sceptical. It was still too early to leap to conclusions, he said. We should wait for all the facts before rushing to judgment. In other words: assume it’s the Muslims until it starts to look like it isn’t – at which point, continue to assume it’s them anyway. If anyone reading this runs a news channel, please, don’t clog the airwaves with fact-free conjecture unless you’re going to replace the word “expert” with “guesser” and the word “speculate” with “guess”, so it’ll be absolutely clear that when the anchor asks the expert to speculate, they’re actually just asking a guesser to guess. Also, choose better guessers. Your guessers were terrible, like toddlers hypothesising how a helicopter works. I don’t know anything about international terrorism, but even I outguessed them. These “but” commenters then go on to discuss immigration, often with reference to a shaky Muslim-baiting story they’ve half-remembered from the press. So despite this being a story about an anti-Muslim extremist killing Norwegians who weren’t Muslim, they’ve managed to find a way to keep the finger of blame pointing at the Muslims, thereby following a narrative lead they’ve been fed for years, from the overall depiction of terrorism as an almost exclusively Islamic pursuit, outlined by “security experts” quick to see al-Qaida tentacles everywhere, to the fabricated tabloid fairytales about “Muslim-only loos” or local councils “banning Christmas”. We’re in a frightening place. Guesswork won’t lead us to safety. 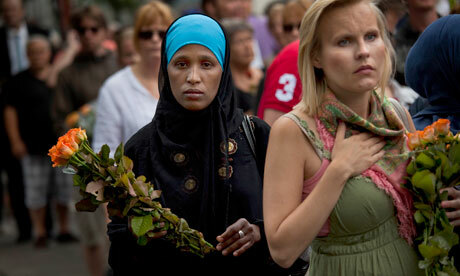 Photograph of mourners arriving for a memorial service at Oslo cathedral, by Emilio Morenatti/AP.